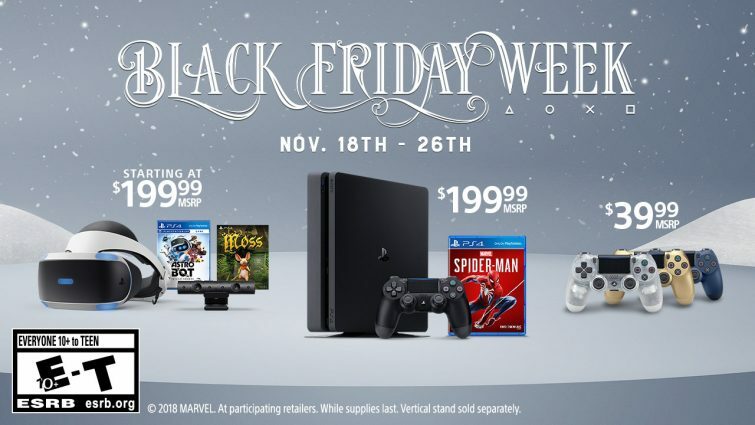 Sony has announced its PlayStation 4 Black Friday week deals. 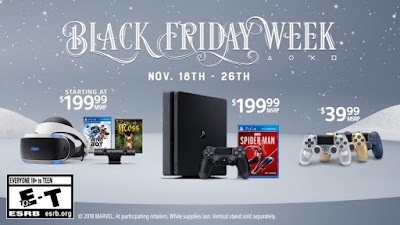 In a post on the PlayStation Blog, Sony confirmed its Black Friday sales will be running from November 18-26 in the U.S. and November 22-30 in Canada. A new Marvel's Spider-Man PlayStation 4 bundle will be sold for $199.99 USD ($259.99 CAN). The bundle includes a standard PlayStation 4 console and Spider-Man. Other deals include DualShock 4 wireless controllers available for $39.99 USD ($49.99 CAN), PlayStation 4 VR on sale for $199.99 USD ($249.99 CAN). Sony will offer discounts on PlayStation Plus, which normally costs $59.99 USD for one year, $24.99 USD for three months, or $9.99 for one month, but didn’t clarify what those deals will be.